Driving While Intoxicated charges are one of the most difficult and technical cases to defend. 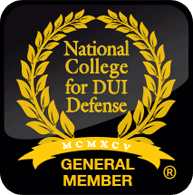 Particularly, when a person provides a breath test sample to the police upon their arrest for DWI a host of techincal issues arise that only a qualified Bryan DWI defense lawyer can handle. Following is information to help clients involved in a DWI breathtest case to understand the important issues involved in defending their charges. The Intoxilyzer 5000 is designed to analyze a sample of a person’s breath based on Henry’s law. When a volatile chemical (ethanol) is dissolved in a liquid (blood) and brought into contact with a CLOSED air space, an equilibrium is formed and there exists a FIXED RATIO between the concentration of ethanol in the air space and the concentration in the liquid. (at a given temperature and pressure) At equilibrium one can measure the concentration of ethanol in the gas phase and predict the concentration of ethanol in the liquid. The problem with the human lungs? They are not a closed system and Henry’s law does not exactly apply. The Intoxilyzer is designed to produce a breath alcohol result exactly corresponding to a simultaneous blood alcohol sample. The problem is the assumption that the partitioning of alcohol from the blood into the breath is 2100:1. Not all persons partition alcohol from their blood based upon this ratio. Studies show partition ratios as low as 834:1. The Intoxilyzer 5000 will overestimate the alcohol concentration of someone blowing with a partition ratio less than 2100:1. The Intoxilyzer 5000 assumes the test subject is in the elimination phase, rather than the absorption phase. It is rarely known whether the person is still absorbing alcohol from their last drink when the breath test is administered. The Intoxilyzer assumes the temperature of the person’s exhaled breath is 34 degrees Centigrade. Core body temperature for humans is 37 degrees Centigrade. For every breath degree over 34, the Intoxilyzer 5000 overestimates the breath alcohol content by about 6.8%. Moreover, the machine is not designed to measure the temperature of the suspect’s breath. Mouth alcohol can lead to erroneous breath sample results. The Intoxilyzer 5000 claims to handle the mouth alcohol problem with a computer program called the “slope detector.” There have been no scientific, peer reviewed studies showing the slope detector works as advertised. The margin of error for the Intoxilyzer 5000 is +/- 0.010 for the reference sample, and +/- 0.020 for the suspect’s breath sample. Beyond this, the sample chamber can have up to .019 gms alcohol/210 liters breath alcohol inside when the machine is reading a 0.00.